Plus, Harry Kane to bag a brace and Liverpool to secure top four. Harry Kane has seven goals in his last six Premier League appearances. LIVERPOOL HAVE A top-four finish in their own hands heading into this weekend, with any victory over Middlesbrough ensuring their spot in the Champions League next season. However, they could still pip Manchester City to an automatic Champions League place if results to go their way. If Liverpool were to beat Middlesbrough by three goals or more and Pep Guardiola’s side draw away to Watford, Jurgen Klopp’s side would finish ahead of City in third place on goal difference. It would guarantee the Reds an automatic place in next year’s European Cup for the first time in two years and give City boss Guardiola an unwarranted headache with a play-off this summer. Liverpool, who have lost just one of their last 11 games in the Premier League, host an already-relegated Boro at Anfield and are coming off the back of a 4-0 hammering of West Ham last weekend. 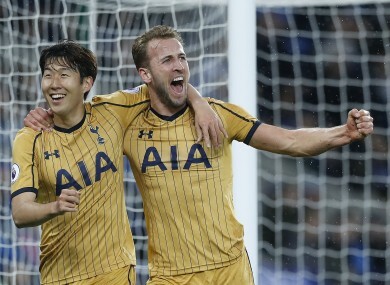 Harry Kane is the man of the moment following his astonishing four goals against Leicester City on Thursday night. The England striker’s sensational performance against last year’s champions has rocketed him ahead of Romelu Lukaku at the head of the Premier League goalscorers’ charts with 26. It was a magical send-off last weekend for Spurs supporters, with Kane’s 48th-minute goal proving decisive as they overcame Manchester United 2-1 in their final game at White Hart Lane. Kane, who was the Premier League’s top goalscorer with 25 last season, has scored 26 goals in just 28 starts in 2016/17. The England striker scored more goals in last night’s game than Manchester United have in their last five. The 23-year-old has seven goals in his last six appearances and faces a Hull side who have shipped 73 goals this season, the most of any Premier League team. The Tigers were dismally beaten 4-0 last Sunday to Crystal Palace, completing their relegation to the Championship. With the champions decided, second place wrapped up and all three relegation places filled, the race for the top four remains the only narrative of significant interest heading into the Premier League’s final day. Man City boss Pep Guardiola recently admitted that if he were at “a big club,” his performances this season would have seen him get the sack. His side can clinch third and an automatic Champions League place with a win against Watford, but know a draw would mean their place in Europe’s premier club competition could be in jeopardy. It is good fortune, then, that they face a Watford side which just this week parted ways with manager Walter Mazzarri. The Italian has overseen a disappointing season at Vicarage Road, currently sitting in 13th place and just six points above the drop zone with five losses in as many games. City’s Gabriel Jesus, meanwhile, enjoyed a breakout season at the Etihad and proved his side’s main goal outlet in the absence of Sergio Aguero. The Brazilian has scored six goals in seven starts this season and will likely revel at the chance to see his season out in style against vulnerable opposition on the final day. It could prove to be a season of relative success for Jose Mourinho should his side conquer Ajax in next week’s Europa League final. However, the manager’s admission that he had to choose one competition over another when discussing the Premier League and Europe shows the high risk involved in his objective. His side’s game against Crystal Palace on Sunday holds no significant bearing on either team’s season — a win for Palace would see them finish at best 12th, while Man United can finish no higher (or lower) than sixth regardless of the game’s outcome. Were the Reds to secure a victory over Sam Allardyce’s side, it would still mark the lowest win total of a United team in Premier League history with 18. A run of draws has seen their chances of a top four finish vanish into the horizons week after week, with 15 draws accounting for their poor league standing. Moreover, another stalemate could be on the cards with minds firmly set on their date with Ajax on Wednesday month. Chelsea will undoubtedly be in party mode as they welcome Sunderland to Stamford Bridge on Sunday where captain John Terry will hoist the Premier League title into the air for the fifth and final time in his career. In a game pitting top against bottom, the Premier League’s finest against its most dismal, Sunderland will be looking to regain some level of respect as they bow out after nine consecutive seasons in the top tier. If they are to put up any sort of performance against an Antonio Conte side who will be motivated to see out their season in the style of champions, top goalscorer Jermain Defoe will almost certainly need to be on the scoresheet. Keeping the Cats afloat this season proved too tall an order even for the evergreen 34-year-old, however he did manage just the 15 goals in 37 league appearances as a likely exit looms away from the Stadium of Light. In what could possibly be Defoe’s final appearance in the Premier League, Thibaut Courtois will likely provide him with a stiff test. The Belgian has kept 16 clean sheets in 35 appearances this season, as Chelsea conceded just 32 goals on their way to the 2016/17 title. The veteran star scored the winner in a dramatic 3-2 victory for Sunderland over the Blues last May and could prove a thorn in their side again on Sunday. Email “Defoe to score, United to draw and other Premier League bets to consider”. Feedback on “Defoe to score, United to draw and other Premier League bets to consider”.